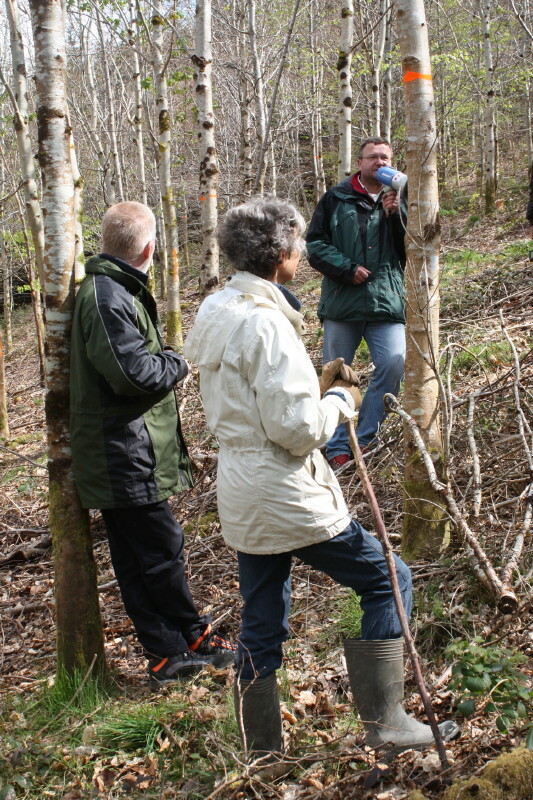 It was both a great pleasure and rather intimidating to welcome the members of ProSilva Ireland to our woods on 28th April 2012. By no means are we trained foresters and though we may have a little more knowledge now than 25 years ago, that is all we have. Despite this, we are so proud of our trees. About 25 years ago we read of the potential for tree growing in Co. Leitrim where we owned a cottage and two acres. We asked a neighbour to plough the ground and we bought 1000 trees in plugs from Brian Hussey’s Woodlands and put them into the ground. Easy. So we looked around for some more land. We bought 40 acres at Drumkirwan. This time became more serious as the grant scheme was involved. The land was spread over two hills with a valley between. I walked over the land with the forest advisor and the rushes and grass were so high that they brushed my chin. He advised spruce, I asked about ash, he told us about interplanting with Noble Fir for Christmas trees. We put several thousand mixed broadleaves on both sides of the house, in effect the valley part of the land. Again we bought S/S from Woodlands Nursery in Tuam. They cost 117 pounds per 1000. The land was mole ploughed and we set to….. For labour we press-ganged our chlldren and any other family members we could get, (my brother-in-law was a horticulturalist). I also contacted the Botanic Gardens where I knew the students were looking for week-end work.. and we were lucky enough to be introduced to local people amongst then Brendan who has been with us ever since. It was very late for planting, May, but all the trees except for the ash, were in plugs of soil, and as we toiled up and down the hill in beautiful weather, my niece said it reminded her of the film Jean de la Florette. And then we returned a week later to find the hares resented our intrusion and had nipped the top four inches off every oak and beech tree. So that autumn we bought tree shelters and moretrees. I had to get a local saw mill to make stakes 1x1x48 inches—– well over 1500 of them. I forget how much the stakes cost, but the shelters were 1 pound each. This next planting was in the winter– better for the trees but bitterly cold twisting the wire ties of each shelter on to the stake with bare hands.. Then followed a few years of tending the trees. We beat up the S/S with 10% silver birch (now almost all suppressed), we stamped down the grass around each tree, we shaped and shaped the oak, we tried to protect the Noble Fir with home made black polythene rings attached to stakes, we cut back the brambles and sprayed them with Roundup and we shaped and shaped the ash and then would come a frost and we shaped again. The vision of a return from Christmas trees died early on as we realiised the customer likes his tree to be free of dead grass, beautifully shaped and clean- not muddy from being dragged over the ground to the trailer. The ash was more promising until we were told it was only good for firewood (though firewood is coming into its own now). About seven or eight years ago I heard of ProSilva Ireland and became completely sure it was the way forward. We thinned first when the trees were 16 years old and again three years later and we are planning our third thinning at present. We are searching the ground hopefully for seedlings and to our delight we have found birch, spruce, sycamore and even a couple of oak. I always wanted ours to be a permanent forest and with a bit of continued luck it looks like we are getting there. We shall have built a real forest which will be there forever producing wood and adding beauty to the countryside. Next Entry Pro Silva Ireland October 2012 Open Forest Day: Forestry and Monuments, Another Approach.